Five Muslim men accused, of branding British soldiers rapists, murderers and baby killers during a homecoming parade have been found guilty, on Monday 01/11/2010, of a public order offence. 1. Jalal Ahmed, 21, 2. Ziaur Rahman, 32, 3. Yousaf Bashir, 29, 4. Shajjadar Choudhury, 31, and 5. 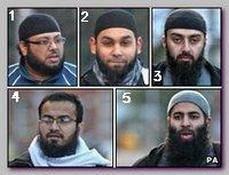 Munim Abdul, 28, all from Luton, were convicted at Luton Magistrates’ Court, UK. They were given two year conditional discharges and order to pay contributions towards costs of £500 each for using threatening, abusive or insulting words or behaviour likely to cause harassment, alarm or distress. Jubair Ahmed, 19, and Ibrahim Anderson, 32, also from Luton, were acquitted of the same charge. Angry scenes broke out during the parade in Luton for the 2nd Battalion The Royal Anglian Regiment, known as The Poachers, on 03/10/2009. A large crowd lined the streets of the Bedfordshire town to celebrate the return of the local regiment, who had served in Iraq and Afghanistan (see also – Wootton March). But a group of protesters also attended carrying placards and shouting slogans about the soldiers, prosecutor Avirup Chaudhuri said. Among these were the jeers: “British Army: murderers”; “British soldiers burn in hell”; “Baby killers”; and “British soldiers you will pay”. Lawyers for the men said their clients discussed plans to protest with police beforehand, had agreed to a time and a place to do so with them, had complied with police throughout and officers had not objected at the time to their slogans. District Judge Carolyn Mellanby said the trial was a test case and described it as “very unusual”. She rejected the lawyers’ argument that their clients were merely exercising their right to freedom of speech as enshrined in the Human Rights Act. She said: “The defendants’ conduct went beyond reasonable legitimate protest”. “Their behaviour was an open expression of opinion on a matter of public interest which was advanced in words that amounted to being disproportionate and unreasonable.” The defendants responded defiantly to the verdict outside court. While Shajjadar Choudhury’s supporters were holding a banner saying “Islam will dominate the world. Freedom can go to hell”, Shajjadar Choudhury himself complained that the trial showed the failure of freedom of speech and democracy. “We already knew the verdict before the trial started,” he said. “Muslims are being witch-hunted for exposing the atrocities being committed in our land which they are occupying” he added. * In yet another development, Anjem Choudary’s organization – Islam4UK, actually a continuation of Al-Muhajiroun, banned in UK on 10/13/2004, was banned too by the British authorities, on Tuesday 01/12/2010. Omar Bakri Muhammad, the former leader of Al-Muhajiroun responded in Lebanon and said that his followers were looking forward to regrouping under a different name. ”Tomorrow we can call ourselves whatever we think is suitable for us,” he said.